There are many non-Christian books that are very good at describing the effects of sexual assault but offer weak suggestions regarding healing. By not believing the Gospel, they advocate self-love and self-affirmation and miss grace—God’s one way love, the unconditional love of God—which is the only thing that gets to the depth of the devastation of sexual assault. Eventually, self-love turns into nihilism. Our book places God’s radical grace and redemption of sin and its effects front and center and responds to the survivor’s experiences, pain, and needs from that perspective. From an interview at Mockingbird here. This looks like an admirable effort, and needed. Mending the Soul is run by Steven Tracy, who teaches at Phoenix Seminary after many years of pastoring, and his wife Celestia. We tend to think of ourselves after death, do we not, as in some disembodied state in some great eternity where all is strange and terrible. But it is really to go home, if you are a child of God, if you are a brother or sister of the Lord Jesus Christ. God is not some terrible awful power, away in some distant eternity; he is your Father. He is one who loves you with a love you cannot imagine. Thank God for human love, but, my dear friends, our human love pales into insignificance and nothingness by the side of the love of God toward those who belong to him. 'My Father's house' is a glorious home. Is Christianity the Only 'Intolerant' Faith? We are not aware of our impotence, we are not aware of our weakness, and of our need for power. As long as we think we can organise [revival], there is no hope for us. The beginning of revival is to realise that without this manifestation of God's power we can do nothing. We have got to get back to that position, in which the apostle Paul so constantly found himself. I am never tired of quoting it. It is the text, more than any other, that needs to be held before every section of the Church today. Unlike most 90s worship songs, this one, for me, just never gets old. Not trendy. But true. Wonderfully true. Last night I read again Edwards' account of his wife's personal renewal in the Lord and, with my decaf in one hand and a big bowl of thin mint Edy's in the other, was deeply moved. 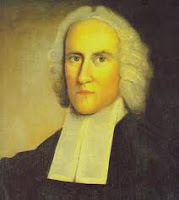 Edwards points out that the 'anonymous' person he is describing (1) was converted 27 years ago, so this is not the passing excitement of a recent convert; (2) experienced this personal renewal four years before Whitefield and Tennent came to town, and at a time when the rest of Northampton was spiritually sleepy, so this is not vicarious feeding on the experience of others; and (3) has suffered bouts of depression from youth, which have now strangely ceased, so this reviving is not explainable by a Myers-Briggs personality profile. You know, at one point Edwards goes on for nine pages of his original manuscript of his account of Sarah's experience with a single paragraph; and in that paragraph he has one sentence that goes for three pages. 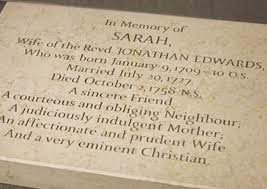 Though the Yale editors break all this up, it is not difficult, in meditative reading, to see why Edwards wrote this way: in describing Sarah's experience of heaven, Jonathan himself was caught up in these glories. And in reading what Jonathan wrote, I am myself caught up in it. The soul remained in a kind of heavenly Elysium, and did as it were swim in the rays of Christ's love, like a little mote swimming in the beams of the sun, or streams of his light that come in at a window; and the heart was swallowed up in a kind of glow of Christ's love, coming down from Christ's heart in heaven, as a constant stream of sweet light, at the same time the soul all flowing out in love to him; so that there seemed to be a constant flowing and reflowing from heart to heart. The soul dwelt on high, and was lost in God, and seemed almost to leave the body; dwelling in a pure delight that fed and satisfied the soul; enjoying pleasure without the least sting, or any interruption, a sweetness that the soul was lost in; so that (so far as the judgment and word of a person of discretion may be taken, speaking upon the most deliberate consideration) what was enjoyed in each single minute of the whole space, which was many hours, was undoubtedly worth more than all the outward comfort and pleasure of the whole life put together. . . . This great rejoicing has been a rejoicing with trembling, i.e. attended with a deep and lively sense of the greatness and majesty of God, and the person's own exceeding littleness and vileness: spiritual joys in this Person never were attended, either formerly or lately, with the least appearance of any laughter or lightness of countenance, or manner of speaking; but with a peculiar abhorrence of such appearances. . . . These high transports when they have been past, have had abiding effects in the increase of the sweetness, rest and humility that they have left upon the soul; and a new engagedness of heart to live to God's honor, and watch and fight against sin. . . .
And this steadfastness and constancy has remained through great outward changes and trials; such as times of the most extreme pain, and apparent hazard of immediate death. What has been felt in late great transports is known to be nothing new in kind, but to be of the same nature with what was felt formerly, when a little child of about five or six years of age; but only in a vastly higher degree. These transporting views and rapturous affections are not attended with any enthusiastic disposition to follow impulses, or any supposed prophetical revelations; nor have they been observed to be attended with any appearance of spiritual pride, but very much of a contrary disposition, an increase of a spirit of humility and meekness, and a disposition in honor to prefer others. I defy you to give me one good reason why you should die without longing for and praying for such renewal in your own soul. Is this not, at heart, what Paul prayed over the Ephesians in the second half of Epheisans 1, and the end of Ephesians 3? How long will you go on burdened and miserable? This is not for the Sarah Edwards's of the world. It is for normal, everyday, faltering Christians like you and me. Christ did not go to the cross, and walk out out of the tomb, and send the Spirit, so that you could (only) doctrinally assent to Ephesians 3:19. You will find this same holy boldness, this argumentation, this reasoning, this putting the case to God, pleading his own promises. Oh, that is the whole secret of prayer, I sometimes think. . . .
Do not leave him alone. Pester him, as it were, with his own promise. Tell him what he has said he is going to do. Quote the Scripture to him. And, you know, God delights to hear us doing it, as a father likes to see this element in his own child who has obviously been listening to what his father has been saying. It pleases him. The child may be slightly impertinent, it does not matter, the father likes it in spite of that. And God is our Father, and loves us, and he likes to hear us pleading his own promises, quoting his own words to him, and saying 'in light of this, can you refrain?' It delights the heart of God. We need to communicate a content-rich message in a compassion-saturated relationship. How Does Freedom from the Law Entail Freedom from Sin? How does Christ set us free from the law? And how does that freedom involve freedom from the dominion of sin? For Owen the answers are clear: Christ sets us free from the curse of the law by taking that curse himself and he fulfills the demands of the law for holiness for the believer by his perfect life. . . . He is the believer's righteousness. But how does freedom from the law entail freedom from the dominion of sin? It is because the believer's union with Christ, which effects his freedom from the law, also effects his 'death to sin,' for he is united to Christ both in his death under the law and his simultaneous death to sin. The two were inseparable in Christ, and through union with him, they are also inseparable in the Christian. That last paragraph is worth digesting. I believe it is deeply Pauline and right, and not frequently explained. If it be so that your death is your gain, be exhorted to wean your hearts more and more from the world. If your gain consists not in staying in the world but in going out of it, how important is it to set your hearts upon it as if it consisted in it. Will you set your hearts upon the things of this life when your gain consists not in this life but in the next? Where your treasure is, there will your heart be also. Is death gain to you? Be entirely resigned to God's will while living or dying: you are always safe in either of these conditions, for you to live is Christ and to die is gain. . . . And seeing it is so that you are got into such a happy estate and condition that either by life or death you obtain your great end, cast yourself upon God's hands: let his will be your will, knowing that whether you are to die in youth or in old age, this year or next, today or tomorrow, whether a natural or violent death, by sickness or by accident, whether at home or abroad, whether an easy or a painful death; yet let it come when, how, and where it will, it will be your unspeakable gain. Luther deeply loved Jesus--the beautiful, caring, human Jesus of the Gospels. Any sermon that failed somehow to hold up that Lord--whose love reached its pinnacle in his self-giving on the cross--so that others could be amazed, as he had been, and then be drawn to trust in the promises and find peace with God and with self, could not be described as preaching Christ. You can be sure of this--all who belong to the Lord Jesus Christ, who have seen the all-importance of the soul, who have seen their dread condition under the condemnation of the Law, who have committed themselves to him, taking upon themselves the scorn and sarcasm of the world, those who have counted all things loss for his sake, who have denied themselves and taken up their cross daily and followed him, those who have said, 'I care not what happens to me as long as all is well between me and him'--these are they who will be with him in the new heaven and the new earth and will share and enjoy his glory forever and ever. If they are told that they trust too much to their own strength and righteousness, they go about to strive to bring themselves off from it, and it may be, think they have done it, when they only do the same thing under a new disguise. A pattern of my own life, many times. Only heart-softening mercy from the great Friend can break the cycle. God moving in Little Rock. An encouraging report from Nancy Leigh DeMoss. Very encouraging to be at the Coalition gathering this week. Mostly because I got to spend time with my dad and one of my brothers. Also great to hug and pray with old friends. More broadly, though, the conference showed us all very tangibly the widespread work God is doing of gospel-unity and gospel-fixation in many diverse evangelical clumps. These conferences also bring out ugliness in me, especially in the heightened temptation to feed on man-approval. Yuck. I have not grown as much in this area as I thought I had. God is patient. But this week has obviously been a big win for the kingdom and if I can have some role in that kingdom in spite of my screwiness, what a wonder. And if you didn't get to Dad's workshop on justification vs. self-justification, you will not regret a careful read of the manuscript. That hour made the whole week worth it. It was timely, even prophetic. Thanks, Ben Peays and Collin Hansen and Don Carson and hundreds of others for your hard work on our behalf, and on behalf of the gospel. The Lord sees. Now that the festschrift has been presented to Dr. Carson I can stop restraining myself at expressing gratitude for Doug Moo's essay on justification in Galatians. Dr. Moo has been studying justification and Galatians for many years, all culminating in a forthcoming Galatians commentary for the BECNT series. This essay is an example of penetrating, careful study and I was greatly helped. 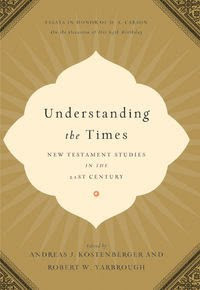 This essay joins Steve Westerholm's chapter on Romans 9-11 as the two best essay-length interactions with the New Perspective I have yet read. Get up, watch, pray, fast, meditate, offer violence to your lusts and corruptions; fear not, startle not at their crying or importunities to be spared; press unto the throne of grace by prayers, supplications, importunities, restless requests. This is the way to take the kingdom of heaven. These things are not peace, they are not assurance; but they are part of the means God hath appointed for the attainment of them. One argument from those who love and follow God yet believe inerrancy to be naive is that it is a false deduction to infer that because God is true and without error, his word must be true and without error. It is suggested that a doctrine of biblical inerrancy, while well-meaning, neglects the full humanness of Scripture's authors--that is, while the Bible is inspired and God's very word, God communicates that word through human words that do, by virtue of their humanness, occasionally err. One untapped place in the Bible, however, that underscores inerrancy by linking the truth of God's person with the truth of God's word is the depiction of Christ in the book of Revelation. In the latest issue of the Westminster Theological Journal, Greg Beale shows how Revelation affirms the historic (yes, historic--thanks for showing us this time and again, John Woodbridge) doctrine of inerrancy. Let us be wise in our thinking, shrewd as serpents, not fighting for inerrancy simply because our parents or seminary profs believed it (though such a factor is not insignificant). But let us also be humble in our thinking, innocent as doves, and not so clever and critical and man-pleasing that we cringe at being associated with inerrancy lest the academic winds of trendiness and scholarly inclusion pass us by. Mrs. Bertha Adams was 71 years old when she died alone in West Palm Beach, Florida on Easter Sunday 1976. The coroner’s report read, 'Cause of Death . . . malnutrition.' After wasting away to fifty pounds she could no longer stay alive. When the state authorities made their preliminary investigation of her home, they found a veritable 'pigpen . . . the biggest mess you can imagine.' One seasoned inspector declared he had never seen a dwelling in greater disarray. Bertha had begged food at her neighbors' doors and had gotten what clothes she had from the Salvation Army. From all appearances she was a penniless recluse--a pitiful and forgotten widow. But such was not the case! Amid the jumble of her filthy, disheveled belongings were found two keys to safe-deposit boxes at two different local banks. The discovery was unbelievable. The first box contained over 700 AT&T stock certificates, plus hundreds of other valuable notes, bonds, and solid financial securities, not to mention cash amounting to $200,000. The second box had no certificates, just cash--$600,000 to be exact. Bertha Adams was a millionaire and then some! Yet she died of starvation. I found this November 29, 2010 discussion fascinating. On the panel are Phil Ryken, Larycia Hawkins, Jerry Root, and George Kalantzis. They who have no Bible may still look up to the moon walking in brightness and the stars watching in obedient order; they may see in the joyous sunbeams the smile of God, and in the fruitful shower the manifestation of his bounty; they hear the rending thunder utter his wrath, and the jubilee of the birds sing his praise; the green hills are swelled with his goodness; the trees of the wood rejoice before him with every quiver of their foliage in the summer air. What comfort hast thou from the article of life everlasting? That, inasmuch as I now feel in my heart the beginning of eternal joy, I shall after this life possess complete bliss, such as eye hath not seen, nor ear heard, neither hath entered into the heart of man, therein to praise God forever. 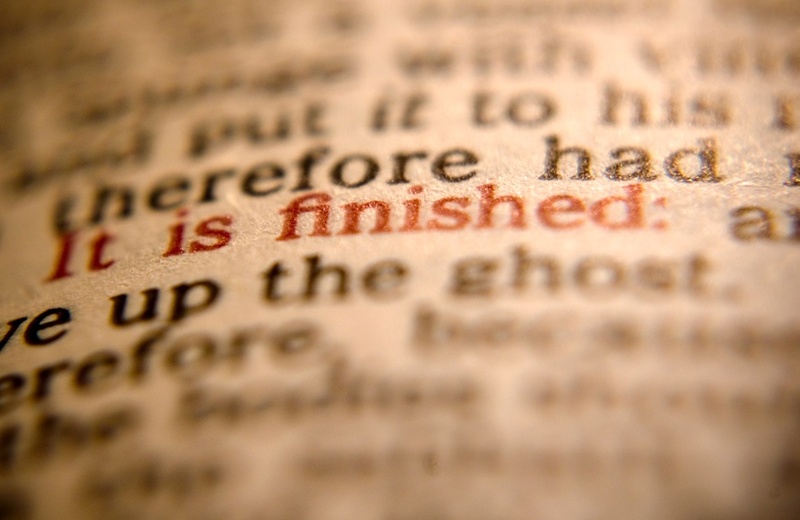 The Bible tells us that in this life and world there is no such thing as final security apart from the message of the gospel. So if we are relying for our final, ultimate happiness upon anybody or anything in this world alone, then we are certain to be disappointed. If our quietness of heart depends--oh, let me put it with almost brutal realism--if we are depending for happiness and joy and a quiet heart, in a final sense, upon any individual human being, upon our family, our home, our profession, our money, our health and strength, we are doomed to experience disappointment. Every one of these things one day will be taken from us.